Current: REED GUNTHER NOT SOLD OUT! REED GUNTHER NOT SOLD OUT! BERKELEY, CA—31 May 2011 â€“ Following the overwhelmingly enthusiastic reception to both Robert Kirkman and Jason Howard’s SUPER DINOSAUR and Mark Andrew Smith and Armand Villavert’s GLADSTONE’S SCHOOL FOR WORLD CONQUERORS, Image Comics has decided to take a chance on significantly overprinting the first issue of its next new all ages title: REED GUNTHER. And because Image is ensuring plenty of copies will be available to reorder after initial orders have been made, REED GUNTHER #1 has not yet sold out! Image hopes that retailers will take this opportunity to introduce new readers to Shane and Chris Houghton’s charming and colorful yarn by increasing their orders. Although initial orders from retailers are historically lower on new all ages titles than their PG-13 counterparts, the publisher believes the success of SUPER DINOSAUR and GLADSTONE’S SCHOOL FOR WORLD CONQUERORS proves that the comics market is opening up to more diversity in genre and readership. Retailers and fans were already given a glimpse of what sort of hijinks they’ll be in for with Reed and his unruly friends, when a preview of REED GUNTHER was published in the back of SUPER DINOSAUR #2 last week. REED GUNTHER is a humorous western tale of hapless cowboy Reed Gunther and his best friend and trusty steed, a no-fooling grizzly bear by the name of Sterling. Readers can soon share in the trouble-making and uproarious fun of the first issue, which includes plenty of close scrapes, a distressingly tough-as-nails damsel, stupid cows, and steak snacking snakes! 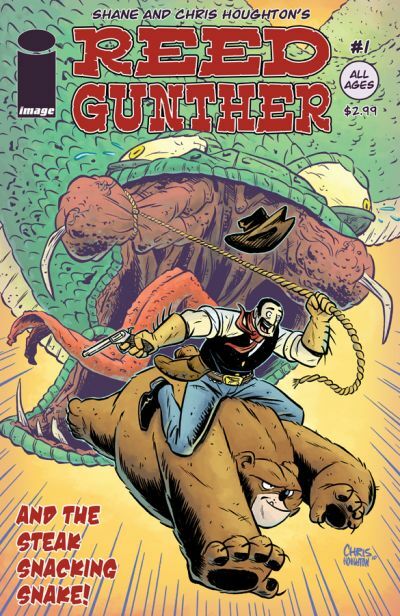 REED GUNTHER #1, a 32-page full-color all-ages western comedy for $2.99, will come galloping full speed into a comic store near you on June 1, 2011. For more information on Reed Gunther, Sterling, and all their unruly friends and foes, visit www.reedgunther.com.